Vocabulary and comprehension go hand in hand. If children don’t understand important words in a text, they won’t be able to make sense of what they are reading. If children don’t have the right words to express their ideas, they will have trouble communicating their thoughts to others. Look through your read aloud and choose high-utility vocabulary words that children can use again in speaking and writing. Choose one to three words to teach during each read aloud. Write vocabulary words in black ink on white index cards or sentence strips (so they look different from word wall words.) Display the words where children can see them during the read aloud. Prepare a child-friendly definition for each word. Use language that children already know and will understand. Decide if you will introduce the words before or during the reading. Teach vocabulary words before if the words are central to understanding the book or if teaching the words during the read aloud will distract from the pace and flow of the lesson. Otherwise, you may choose to teach the vocabulary words during the reading time. Plan if and how you will revisit the vocabulary word after the reading. This might be the time you and your children go deeper into the meaning of some words and relate the vocabulary to the central ideas of the book. Introduce the vocabulary words one at a time. Ask children to repeat the word at least one time, so they have practice with pronunciation. Make sure to use the word in context as well as give the definition. Choose teaching strategies that require children to interact with words in meaningful contexts. Point out vocabulary words when you encounter them in the book. You can check children’s understanding or remind them of the word’s meaning. Think aloud to model strategies readers use to figure out new words. These strategies include using context clues or using familiar word parts to figure out new words. 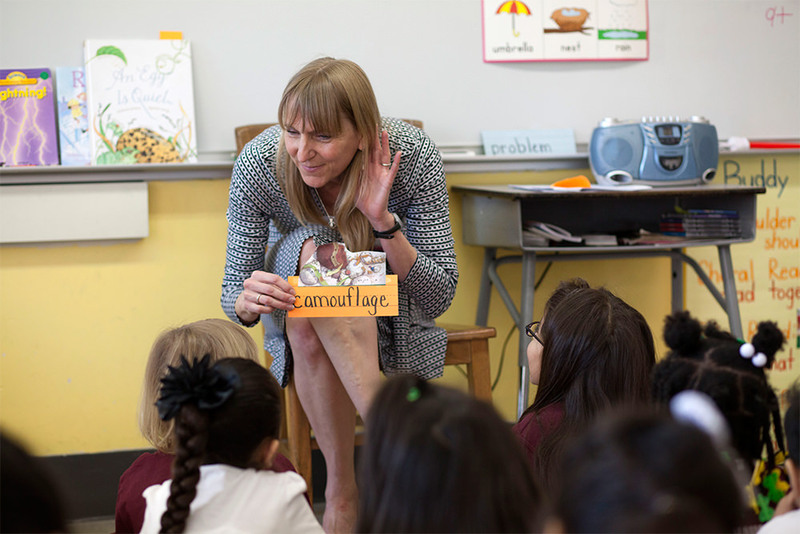 Choose some read aloud lessons in which vocabulary is the primary literacy objective. Choose words that are central to comprehending the story. Prioritize words children need to understand the theme, characters, or concepts in the book. Focus on abstract vs. concrete words. Concrete words (accident, stoplight, cellar) are mastered much more quickly than abstract words (persist, noticed, and scorching). Select words that are part of semantic word families. (secure, securely, security) Be mindful of the different forms one word can take when you introduce new words. This can be confusing for children. Look for adjectives with similar shades of meaning (downhearted, dejected, morose, brooding) and verbs in the same general category (strut, amble, saunter, trot, gallop) in a book, or across different books. Children need to know a wide variety of vocabulary words to read and comprehend text. In Bringing Words to Life, Beck, McKeown and Kucan classify words into three tiers. Tier I – Basic vocabulary. These everyday words don’t usually require direct instruction. Children pick them up because they are used frequently in casual conversation and simple books. Examples include: book, go, dog, house, blue. Tier II – High frequency, multiple meaning vocabulary. These are the words that are important to teach through read alouds. They show up in many children’s books and can be used in daily life and in children’s writing. These are sophisticated words that occur often in mature conversation and across different types of literature. They are important for reading comprehension and descriptive writing. Many of them have multiple meanings. Examples include: furious, devour, forlorn, perch. Tier III – Low frequency, context-specific vocabulary. These are words that are found in specific domains such as academic subjects like history, science, or math. They can also be found in hobbies, sports, occupations, etc. They are important to teach as part of the content or subject area you are studying. Examples include: isthmus, divisor, photosynthesis, and acrylic. 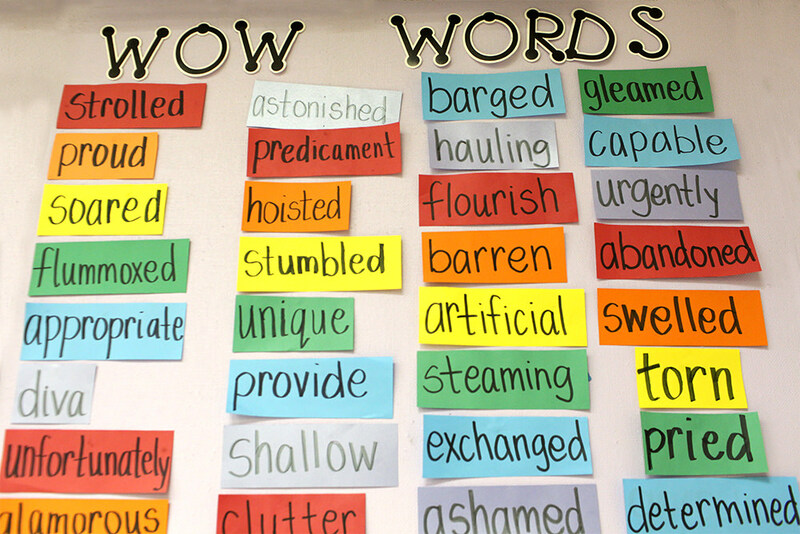 Use these strategies to help children interact with new vocabulary words in meaningful ways. You can use these to introduce new words before your read aloud or to reinforce vocabulary after the read aloud and during other instructional practices. Ask which words go with which sentences and follow up with why they decided on that connection. For new words accomplice and philanthropist, ask children: Which word goes with crook? Which word goes with “gift to build a new hospital”? Ask children to associate words with context and activities from their own experience. For the new words, urge, commend, and banter, ask children to describe a time when you might urge someone, commend someone, or banter with someone. Ask children to clap in order to indicate how much they would like to be described by a word. Follow up with why they feel that way. Provide children with sentence stems that require integration of the word’s meaning. Ask children to interact with the target word by explaining examples of the word in use. What is something you could do to impress your teacher? Your mother? List examples of situations that do and do not apply to the target word and ask children to respond to those situations that do apply. If any of the things I say might be examples of people clutching something, say “clutching.” If not, don’t say anything: holding on tightly to a purse, softly petting a cat’s fur, blowing bubbles and trying to catch them. Ask children to create examples of target words. If there was an emergency at an amusement park, what might have happened? If you had a friend who watched TV all the time, how might you coax him to exercise? One way to support children as they integrate new words into their speaking and writing is posting vocabulary word banks. Word banks are lists of words generated by the class from read alouds and content area instruction. 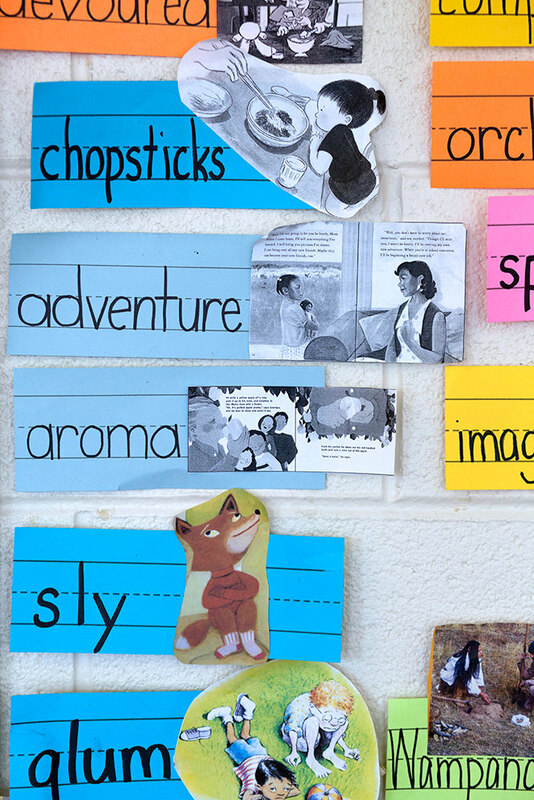 Word banks encourage children to collect, explore, and use new vocabulary. Post vocabulary words throughout the classroom and separate from the high frequency word wall. Build banks of meaningful words over time through read alouds and content area work. Group words together in ways that make sense to children. Think about how word banks can support children to learn new words and use them in their writing. Refer to the word banks often and teach children to use them. Add picture support to vocabulary words to help children remember word meanings. Use photos of your children, copies of illustrations from books, or drawings to illustrate the vocabulary words that you post. This is especially helpful for beginning readers and emerging bilingual children. Connect the vocabulary from the read aloud to other balanced literacy practices. Use the word during a modeled or shared writing lesson. Teach children how to use the words in their independent writing. Revisit the words in small group instruction. 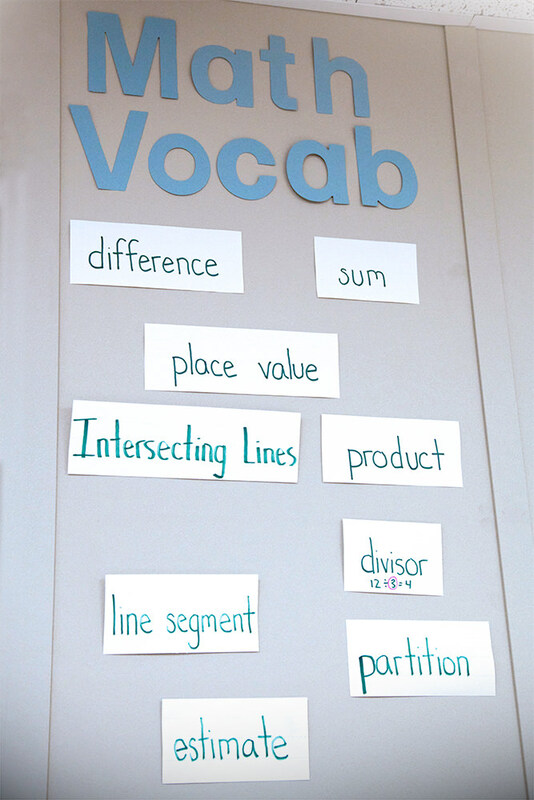 Create a vocabulary center or workstation where children can work with words. Children can play charades, complete graphic organizers like word maps or four square, create a drawing that shows the meaning of the word, search for words with similar features (i.e., root words, prefixes, same parts of speech), or complete word sorts. Extend the learning throughout the rest of the school day. Have children wear a word around their neck. Challenge children to use the word during the day. Encourage children to teach the new words to family members at home and report back. Look for opportunities to use the vocabulary words in “real” life. This is especially essential for ELLs. We want to have high expectations and rich language for children to encourage their exploration of using words and language. Post vocabulary words throughout the classroom. Group words together in ways that make sense to children and support them to use new words in their writing. Refer to the word banks often and teach children to use them. Thanks for posting the resource, Jake! It looks quite useful. This is an amazing site that uses over 8,000 vocabulary words in simple, contextual sentences.